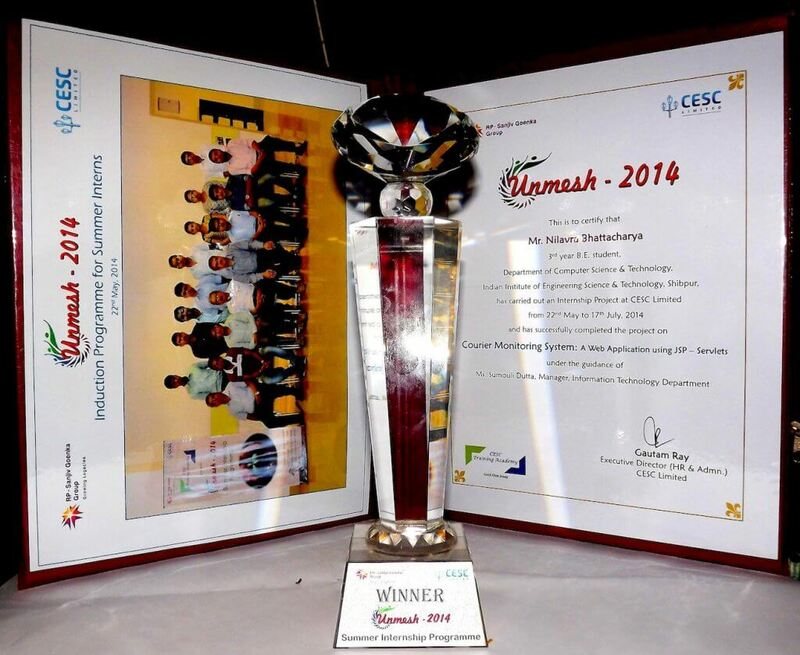 Award winning web-application project to monitor the timely printing and delivery of electricity bills to consumers. After completing my third year, I secured an internship at Unmesh Summer Internship Program 2014 by CESC Limited. In about 6 weeks, I developed the Bill Delivery Monitoring System. It is one of the most complex and real-time web applications that I have ever created. The system became immensely popular, and was instantly moved to production. I won the best intern award that summer. WHEN: Jun – Jul ’14: Development • Aug ’15 – Jul ’17: New features, maintenance. A web-application to monitor the timely printing and delivery of monthly electricity bills and notices (defaulter’s bills) to consumers. Three kinds of users – CESC Officials, Bill Printing Vendor, and Bill Delivery (Courier) Vendor – with different sets of use cases via common login. Granular monitoring of bill printing (three events) and bill delivery (three events) in sequence. Automated SMSs sent to consumers when their bills are calculated, and are out for delivery. For ease of interaction and reduce input mistakes, textboxes have not been used. The main process flow is merely a series of button clicks. Website is fully responsive and mobile friendly – first of its kind to be implemented for the company in 2014. Courier Partners have benefitted the most, as they can tap the buttons easily in their phones / tablets, while on the road, delivering bills. Whole back end implemented using JSP-Servlets and Java Classes. Designed SQL schema for high scalability and robustness. Designed an intuitive front-end for easy tracking of bill delivery, and associated miscellaneous reports. Automated SMSs are sent to hundreds of consumers using dedicated SMS gateway, which are triggered for certain events. System is live for over 2.5 years, with approx. 100,000 database hits per day from different users. Login page only, as system is live, and access is restricted. The Winner Award for developing the Bill Delivery Monitoring System (then known as Courier Monitoring System) while still a 3rd year undergraduate student. The system was made live immediately upon completion, for about 2.9 million consumers. Login Page – redirects three kinds of users (CESC, Printer, Courier) to their respective sections. CESC Section: Delivery Tracking Page – showing process flow in action. CESC Section: Delivery Tracking Page – process flow completed. CESC Section: Another view of the Delivery Tracking Page. The red circles indicate that the event took place within 6 days of bill / notice due date. CESC Section: Delivery Timeline Page. The red line shows current time. CESC Section: Delivery Analysis page. This page shows defaulting / habitually inefficient couriers. Printer Section: Printer has two actions for bills and notices each – print, and despatch to courier / SWRO (special office for notices). Unless previous step is completed, next step’s action button is kept disabled. Courier Section: Courier has three actions for bills and notices each – receive, out for deliver, delivered. Like printers, Couriers cannot perform the next action without completing the previous step. Automated SMSs are sent to Consumers which are triggered with different events. The first SMS is sent as soon as bill data is sent to Print Vendor via FTP. The second SMS is sent when the Courier clicks on “BILLS -Out for delivery” button. The entire website is responsive – the first of its kind for the Company in 2014. This is the Courier Section. Couriers have been especially benefitted with this mobile friendly site. They are able to click the buttons easily in their phones / tablets, while on the road, delivering bills. CESC Section: mobile responsive view.